This tutorial explains how to combine / append two data sets in SAS. In SAS, there are various method to append data sets. It can be done with data step method, PROC SQL as well as procedure called PROC APPEND to accomplish it. It is one of the most frequently data manipulation task in analytics work. For example, you have multiple human records files from various departments of your company and you are asked to join them so that there would be a single file containing information of all the departments. 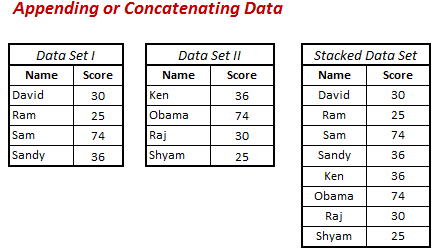 Note : The stacked data set is not sorted because we have not used BY statement. Interleaving combines individual sorted SAS data sets into one sorted data set. You interleave data sets using a SET statement and a BY statement in a DATA step. Make sure data sets are sorted before appending datasets. Datasets can be sorted with PROC SORT. OUTER UNION CORR keyword is used in PROC SQL to concatenate two data sets. 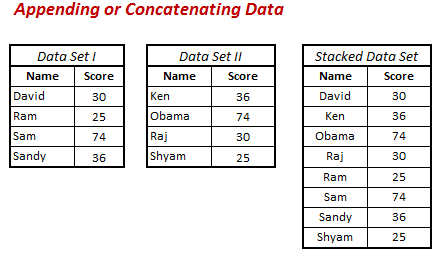 The CORR tells SAS to append data sets by name (not by column position). The output of PROC SQL is same as the output of previous example. If you want to append data and store it to another dataset, you can run PROC APPEND twice to do it. In the first PROC APPEND, it would create a base table ALLDATA (as specfied in the code below). If the dataset ALLDATA does not already exist, it would be automatically created by SAS. PROC APPEND is faster than SET statement or PROC SQL UNION because it only reads in the data set being appended (i.e. the dataset identified by the syntax ‘DATA=’). PROC APPEND is most useful when you use it in a macro. For example, you create a macro in which there is a loop for calculation of some metrics of multiple variables. In each iteration, it returns a data set which needs to be appended with the output of subsequent iterations so that once loop completes all the iterations, we would have complete data set. Suppose you have two datasets having same variable names but the length of the common variable is different, It would throw a warning and it would not append datasets. To workaround this issue, we can use FORCE option to append the data sets. Warning : It overwrites data. The question arises " why do we use multiple set statement if it overwrites data". 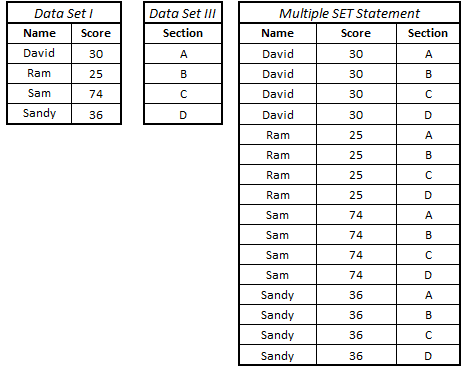 The next topic describes the application of multiple set statement. It combines data sets by adding column from the other dataset. Unlike INNER/LEFT Joins, it does not require any primary or unique key to join two datasets. Multiple SET statement can also produce cartesian product of two tables. It can be done with POINT= option. 3 Responses to "SAS : Combining and Aggregating Data"
what is the effect if we don't sort the data sets before appending? If you are using BY statement in merging but dont sort the data then the code will error out. As we know the mining services and its use then here is the advanced version of it for you by using it you can earn the more money and values, before using it's you have to read the best cloud mining companies reviews after reading the reviews you can select the best cloud mining services provider for you to start your mining.